Patchverk’s more of a knock-knock joke guy. PUNS!? Oh my god, what kind of third-rate artist would resort to such a thing? I am very intrigued to see more of this puppet king. Will he be a full on villain, a well-inentioned extremist, or just as benevolent as the otter sovereigns? I look forward to seeing what happens! For the moment, he seems like an affably evil villain. Let’s leave it at he is a horrible person. This is a stage act, ya hear? Anyone who makes puns illegal is my mortal enemy. As a character, or because he’s evil? I just noticed his crown emotes along with him. I can see why he thought all of this was so much more important than the boring ol’ giant rip in the sky leading to a world of undead creatures that want to destroy all life. His interruption has been totally justified. No puns? Then how does he feel about Connie and Trashy? A statesman must compromise for a greater good. Not sure if that applies to a statespuppet. 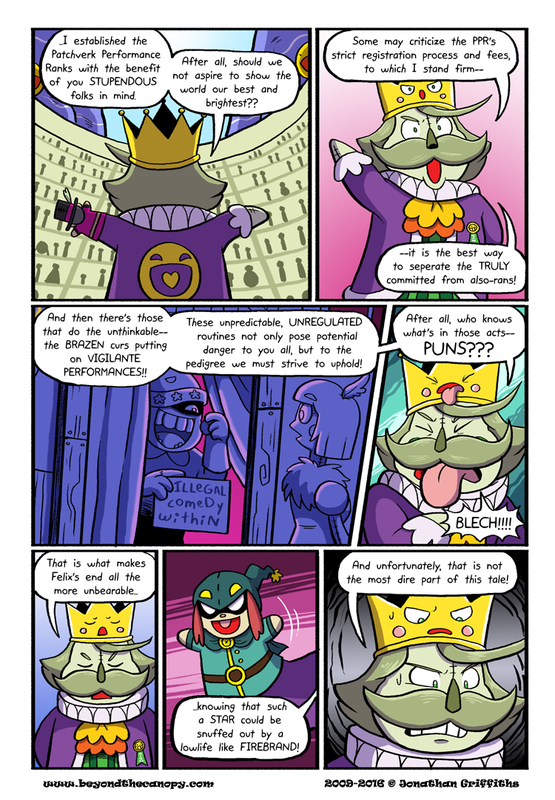 By the way, does a statespuppet rule over a puppet state, or is this kind of reasoning verbotten under King Odwolfe, the first (and hopefully the last) of his name?